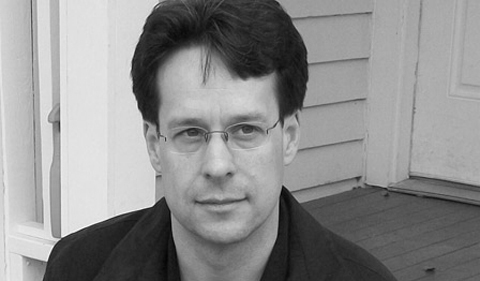 The 2016 Spring Literary Festival welcomes author Kevin Prufer for a reading on Thursday, April 7, at 7:30 p.m., in Baker Ballroom, and for a lecture on Friday, April 8, at 11:00 a.m., in Alden 4. Kevin Prufer is an American poet of the spooky-sad and the mysteriously funny. He’s an academic, an editor, a teacher, and an essayist whose most recent books are Churches, In a Beautiful Country, and National Anthem. His honors include three Pushcart Prizes, and awards from the National Endowment for the Arts, Poetry Society of America, the Academy of American Poets, The Lannan Foundation, and other organizations. There are many reasons to love Prufer’s poetry: his descending, eloping line (it’ll run away with you without warning); his use of the page’s white space to enhance a poem’s look, feel, and sound; the distinctive, off-kilter grace of his imagery; or his ability to write political poetry that is interested more in the discrete universal moment than the personal or the partisan. Perhaps this preference for avoiding the didactic derives from Prufer’s Midwesternliness (he was born and raised in Ohio). He also spent a large chunk of his adult writing life in rural Warrensburg, Missouri. But, though his writing is interested in the people and politics of those places, he rarely writes about a factual version of himself. When he does, it is often about the way the self blends into society as a whole. And even in these instances, the personal details seem to be less about drawing attention to the speaker and more about creating a distance between what’s regular and what’s strange. looking at the mess of postcards on the floor. gently touching the broken window. “It’s called dying,” she said. Prufer stretches things this way, blending the voice of speaker and character, the upper-register of poetic exploration and the lower register of offhand speech. He takes history, personal stories, myths, philosophies, and even physics, and bends them into a sort of eerie reality where the reader can look at common poetic topics—mortality, impermanence—in an uncommon way. Reading his work can be a bit like journeying into an uncanny valley. These worlds are almost familiar, but something has gone all cartoon-mirror on us. We lived in its shade. that swagged low over our camp. gazing past our mountain toward the burning cities. Some feathers were tawny, others tinged a perfect white. It may be a sparrow. I can’t see its face. An eagle? I think it’s an eagle. We often played this game. Who would find his jawbone in the loam? like glitter in the new wood? wouldn’t that be mercy, too? Here, the speaker declares that forgetting about cruelties might be merciful. But he also asserts that remembering them or even using them for our own ends—however small or chintzy—might also be mercy. The poem itself is a charm given to the reader, so we’re left pondering Is this mercy, too? There isn’t an answer, but we’re left with the suggestion that remembering (and even appropriating) a past cruelty can be an act of mercy. And so can forgetting it. In this poem and others, Prufer continues to explore our inconsistencies, and what poetry can do in the face of pain and ambivalence. We don’t get much insight into Prufer’s personal views, aside from a wide and varied concern about the harm we do to ourselves, each other, and, well, everything else on the planet. What we get in the place of explicit politics is a better idea about what big questions we should be asking. How do we find understanding in the shadows? What are we to do when what is merciful is also cruel? And what are our responsibilities when we express that relationship in art? it’s at home on the table where she left it, she’s sorry, please let me through. I’m an old woman, do I look like a terrorist? Prufer’s decision to focus on the old-woman-terrorist after giving us the context of a badly hurt brother is jarring. The reader is knocked off-balance by its very inclusion, but then Prufer throws us for another loop toward the end of the five-page poem. When he is finally in the hospital with his brother, he reveals that the story about the old woman is an invention. still, I think they should have let her through. and still you can’t hear me, though the doctor says it’s ok to talk, how can it hurt? Prufer makes clear in his poems that he’s not going to shy away from any painful reality. But his work also finds a wary kind of hope in the persistence of people loving one another amid overwhelming threats and uncertainties. This persistence can be seen in the title poem of Kevin Prufer’s Churches, when a dying father makes a church steeple with his hands, allowing us to find some mixed deliverance, even through a battered God, even in a quavering, creative gesture.